If you have ever played Super Mario Brothers back on the NES or one of the many re-releases and emulations on various Nintendo consoles you would have seen this screen if you were good enough. You get to play Mario our favorite plumber in red overalls. He was summoned to the Mushroom Kingdom to rescue Princess Toadstool, or Princess Peach as she is known currently, from the evil clutches of King Koopa, or Bowser as he is known as now. If you are playing the game normally without shortcuts, and there are many, you go through the valley, go underground, and then come back up to some canyons to get to the first castle. Could you imagine Mario going through all of the goombas and koopas, bottomless pits, and lava to get to the face off he was waiting for. 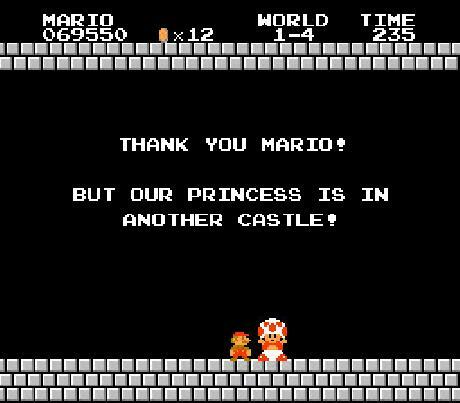 He has to save the princess. Mario shoots a fireball from his fire flower, he hits Bowser in the chest. Bowser returns fire but Mario dodges. Mario shoots another fireball and Bowser counters with his own. Bowser jumps over your ball of flames but Mario is burned. Thankfully the power of Fire Flower weakens the blow but Mario cannot attack. Mario dodges the constant barrage of flames and wait for the perfect opportunity. As Bowser lunges at Mario. Mario rolls under Bowser reaches the other side of the bridge and cuts cord holding it up. Bowser falls into the pool of burning Lava below. Mario looks back and see that it wasn’t Bowser it was a goomba in disguise.